This kit provides the new 2nd Gen. WM Hose enclosure PN 5856 with Mounting Bracket Kit PN 5911. The complete Waste Master 20 Ft Hose folds in a U-shape inside the Enclosure. Click here to see graphic showing hose inside enclosure. Mounting Bracket Kit for enclosure mounting provides easy installation and wide adjustment range. 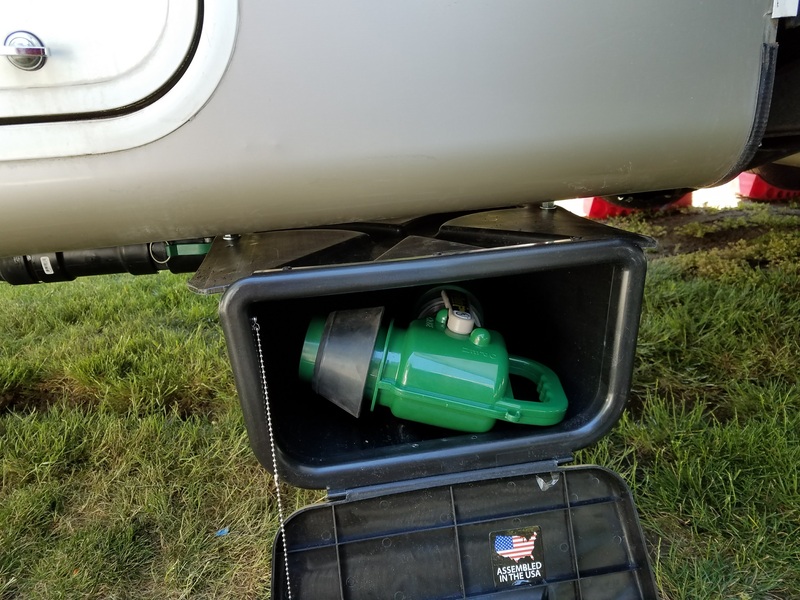 Meant for 5th wheels and travel trailers, enclosure can be mounted so the hose stays permanently connected. Vent Kit PN 5903 allows air release for easy Hose extend and retract. Waste Master Hose and Vent Assembly Kits are not included with PN 5912. For cost effective shipping and ordering ease, several kits are listed on this site and in the 'Features' tab. Fits majority of RVs - CLICK HERE before ordering to Quick Check your RV's adaptability to the Waste Master system. Kit includes the 2nd Gen.WM Enclosure PN 5856 and the Mounting Bracket Kit PN 5911. The enclosure not only stores a complete WM 20 Ft hose with nozzle PN 5816, it can be mounted so the hose can stay permanently connected, eliminating the need to disconnect every time. The system totally simplifies waste management - the most challenging task for RVers. The hose sold separately, uses patented Sta-Put technology with 4:1 collapsibility so a 20 ft hose stores easily in the enclosure with the nozzle. The Mounting Bracket Kit includes the Bracket and matching 3/8 inch, SAE hardware set needed to mount the Enclosure. 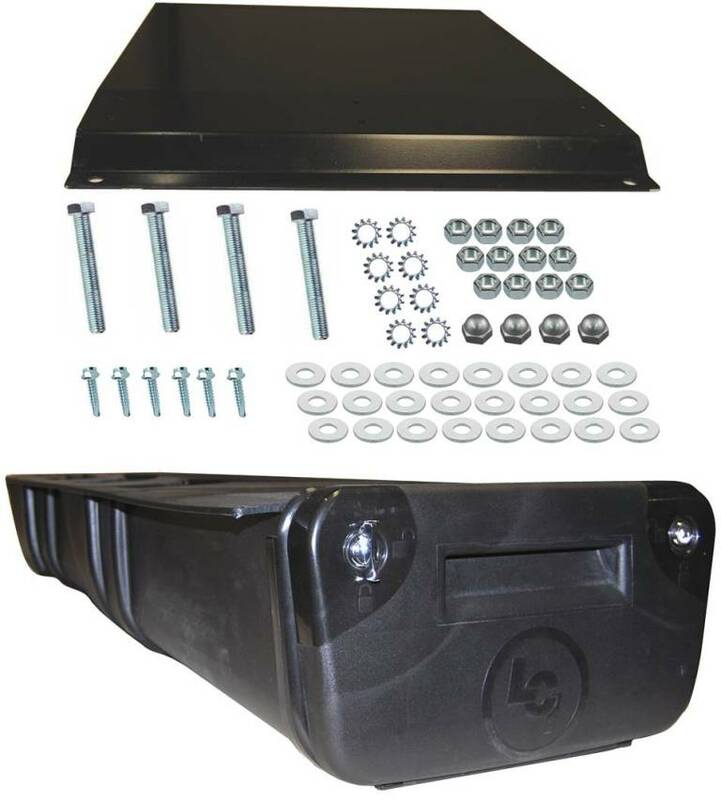 The Bracket is a steel part, preformed, drilled and powder coat finished in Black and mounts to the underside of the RV (5th Wheel or Travel Trailer) I-Beam or Chassis with self tapping screws. Using 4 point support the bracket firmly anchors the enclosure by its outer 'wings' using the included hardware. Documents listed in the 'Install' Tab show the user how to determine the bracket and enclosure location based on the RV's sewer outlet location and other relevant features. A wide range of adjustment is feasible. A key factor is the 'Drop Height' defined as the distance from the bottom of the I-Beam to the top of the enclosure. The Mounting Bracket Kit allows Drop Height adjustment from 1 to 4 inches, covering majority of applications. If your RV configuration requires greater drop height or needs the sewer outlet relocated, please contact us for a possible solution. We have assisted many RVer's successfully customize their system. There may be unique situations where extensive modifications may be required which the user may not wish to undertake. In this case the Bracket Kit may be used to mount the enclosure to simply store, retrieve and restore the hose in a neat, convenient, user friendly manner. To hook up, just open the enclosure door, grab the convenient nozzle handle, pull out the hose and plug the nozzle into the ground inlet. To store, close the nozzle valve, pull it out, collapse the hose back into the enclosure to re-store it with the nozzle. It's that simple. The hose can be removed should the need arise. If you need help we will gladly provide any advice and hand holding needed and share with you examples of other installations. Man's mind when stretched to new dimensions never shrinks back to the old - once you enjoy the convenience of a permanently connected hose you will never go back to the old ways! 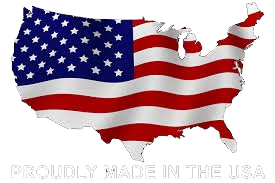 RVers who have this system are simply overjoyed with it and are sharing their stories with others. So will you! • PN 5903 Vent Assembly Kit. For Permanently connected hose system use PN 5816 (20 Ft Hose) and PN 5903 (Vent Assembly Kit). The Vent Assembly Kit includes Female Cam Loc fitting with a 3/4 " pre-threaded hole for the release valve. This allows the hose to extend and retract with dump valves closed for the ultimate in convenience. PN 5817 Hose kit comprises the 20 Ft. Hose PN 5816 and Female Cam Loc fitting. It can be used as a Hose Store only system or in the Permanently connected configuration but requires a dump valve be 'open' during hose extend or retract. This method is used if the Vent Assembly Kit PN 5903 is not mounted or used for any reason. The preferred and recommended method for permanently connected configuration is the one above using PNs 5816 and 5903. • Max. Width at Top: 17"
• Storage Options: Primary - as Permanently connected Hose configuration; Optionally - Hose storage only. The links below provide a set of companion documents related to the Waste Master System installation. Select the applicable documents and follow the instructions to complete the installation process. WM90 Waste Master System User Manual - UNDER PREP - Coming soon! Why did I buy the system? Our new Tiffin Allegro Open Road has two slides on the driver’s side, one of which covers the wet bay compartment. With two arthritic knees and a replaced hip, I have difficulty crawling under the slides to dump the tanks. We snowbird in Pismo Beach, CA for 4-5 months each winter and it is too cumbersome to pull the slides in every time I need to dump the tanks. Plus, being 6’3” means I have to really crouch down to avoid hitting my head on the slide. So I was looking for a way to dump the tanks remotely. How was the system installed? I elected to go to the Drainmaster facility in Hollister, CA and have them do the installation. The way Tiffin setup the wet bay, there was a partition blocking direct access to the tanks. I was reluctant to disconnect all the plumbing and electrical connections on that partition, so we stopped by Hollister to have it installed on our way south for the winter. Ignacio and Doug did a great job on the installation. Very professionally done and I was able to watch so that I know how it was done. I’m very glad that I had it done and that they did it so well. How satisfied am I with the system? I am totally happy with the system. I can now dump the tanks from inside the coach or from a back compartment outside. The results actually exceeded my expectations as now my wife is willing to dump the tanks – something she would never go near before. I have been a customer of Waster Master for the past four years and have been a RV’er for the past 25 years, owning class A motorhomes and 5th wheels. In my years of RV’ing the most unpleasant experience is black and grey water dumping. The bayonet style hook ups are at best inefficient and at worst a smelly unsanitary condition. Four years ago I purchased a 2006 Alpine Apex that was fitted with the Waste Master System. After learning the workings of the system, I am extremely satisfied with the various functions the system performs. From the nozzle with open/close positions that prevent unwanted spills, to the clear plastic window at the nozzle, to determine the clean out is finished. Friends who have RV’s and have seen how my system works, are quite interested in Waste Master, with the idea of retrofitting their vehicle or the purchase of RV’s equipped with this system. That is however, a limited option within the industry. I do believe this is a far superior system compared to present archaic systems being installed in today’s RV’s. This to me seems to be a very strong selling point in the making of rv’s and I’m surprised more of the industry hasn’t upgraded to Waste Master. This is a system that is not limited to just Class A motorhomes, in my humble opinion. I believe that my next purchase of a class A motorhome or other type of RV will be influenced by whether this system is installed. We purchased our Waste Master hose a few months back but really wanted to add the hose storage to get the full benefit. We purchased the storage box from Drain Master but were not comfortable with the installation because of the possibility of drilling into one of our holding tanks. We called Drain Master for some advice. One of the first things they asked was if we would be in the area of their shop in Hollister, Ca in the near future. As luck would have it we had a trip planned to Monterey during the summer. They told us to come by and they would be happy to do the install for us. From the minute we showed up we were treated like family. Doug and everyone in the office were super friendly and invited us into the warehouse to look at other products and accessories. The installation was flawless and looks and functions as good as a manufacturer install. The system is amazing and turns one of the more unpleasant necessities of RVing into a clean and simple process. Great product, amazing service and great people!